A man is in custody after he was allegedly found sleeping in a stolen dump truck with its engine running. The large service truck was found parked across a sidewalk in front of the pedestrian bridge on Shirley Avenue in Kitchener. A wood chipper was in tow. The truck left deep furrows in the grass on either side of the sidewalk, with its rear wheels several inches underground. An employee on his way to work at a nearby business spotted the truck with the engine running and called the police. “I opened up the driver side door and yelled to the guy that was inside sleeping and he wasn’t responding, so I shook him awake, and he was very groggy and kind of out of it,” explains Alex Wielhouwer. Another passerby says the person inside was revving the engine, which had him worried that the truck was going to crash into his vehicle. Police arrived on scene shortly after and arrested the man. 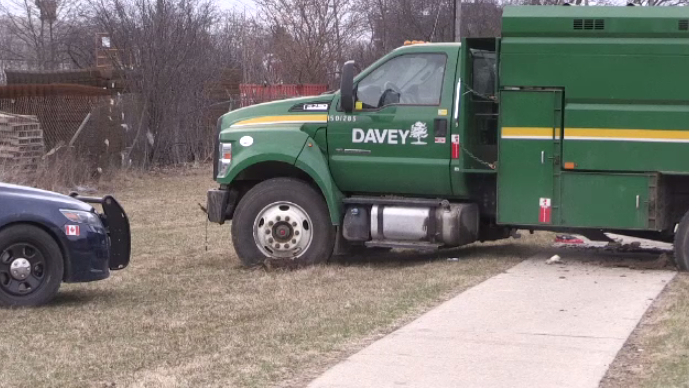 A passerby says police arrested a man who was sleeping in the stolen dump truck. 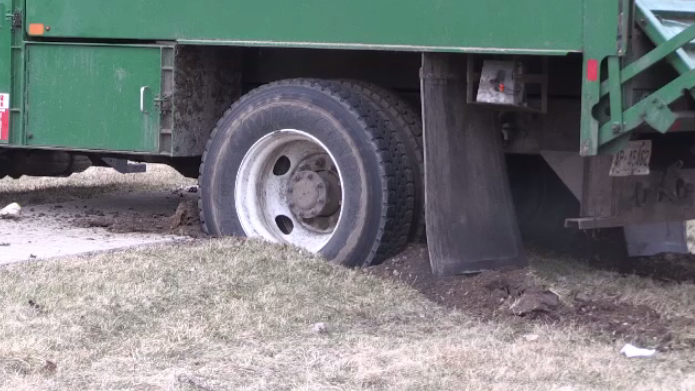 The dump truck's rear wheels dug into the ground.